Central location on the Costa del Sol, just behind the Costa del Sol main hospital. In a fairly upmarket urbanisation, with very little property close by the course itself. The setup is comfortable – large clubhouse but not excessive, good parking. Nice practice putting areas and driving range – actually the driving range I like so much I use it most often when I do decide to practice my long game. The greens are good – large and medium-paced rather than fast. The green surrounds are very easy – tightly mowed to about 1 centimeter up to 3-4 meters just off the green. That makes them superb for accurate pitching. The fairways are medium width, good quality and carefully mowed. Generous first-cut rough off the fairway is carefully mowed to an exact height (that a very low-handicap golfer will view as a minor inconvenience). Beyond that parts of the course - like between one green and the tee boxes on the next hole - are then mowed to a slightly higher grass height. To find tough natural rough (where natural dry thorny Mediterranean vegetation grows) you have to miss the fairways by quite a lot. For average (mid-handicap) golfers, it is easy to avoid these tough areas if you play conservatively along each hole. This is not a course where you have real challenges requiring risky shots. The hole layouts are not difficult – on all but two or three tee boxes you can see the green that you are heading towards. Small but high-quality bronze metal hole-maps mounted on granite are available on each tee box. There are a reasonable number of bunkers, carefully trimmed although the sand in them is not the highest quality - fairly large-grained and packs down too much. 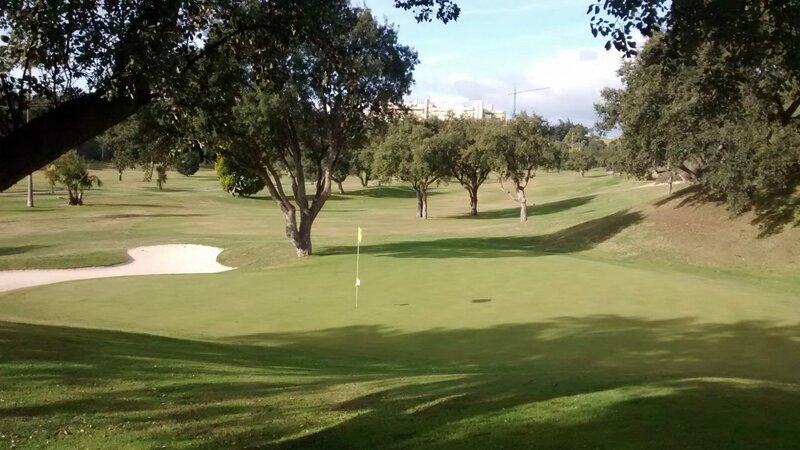 They have kept some old olive and oak trees in careful positions on and adjoining fairways – well done. What does this all mean ?. Well basically it means Santa Clara is a pussycat of a golf course not a tiger of a golf course. It wants to be your friend, not bite your arm off. There is virtually no severe rough out there. Even if you miss a fairway or green by 5-10 meters, you are still likely to end up with a reasonably playable shot. A very high-handicap player could walk off a green here scoring 9 for the hole – not realising that on a similar hole on a different golf course they would have lost two balls and walked off the green with no score whatsoever. So this is a forgiving golf course – quite deliberately. Simple hole layouts + very forgiving mowing of almost everything off fairways and greens + large and receptive greens = very forgiving. I do not mean this course is easy – of course you still have to pick the right club and hit the ball as intended. But Santa Clara is a good golf course for players with 25+ handicap. They can have a lot of fun out there and walk off feeling they actually played proper golf. Sure they might have reached a green in 6 shots when regulation is 3, but at least they have something to put on a scorecard – unlike other courses where their scorecard would be swamped with X's. 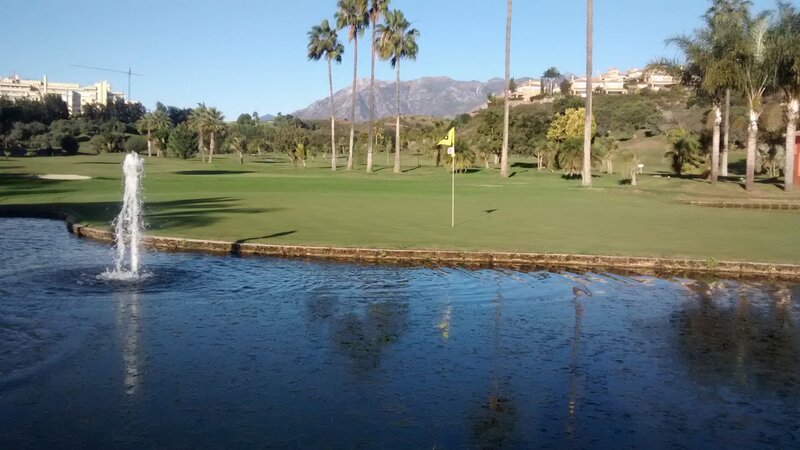 In short if I was asked to recommend "top 5 courses for not-very-serious golfers on the entire Costa del Sol to have a fun and rewarding day out", then Santa Clara would definitely be on that list. Now what about better golfers. Well as a 15-handicap off yellow tees I thought on every tee box that "par on this hole is a good possibility". If I was really playing well and making key putts, I could even see myself breaking 80 (rare for me). A low-handicap big hitter could really let rip on this course - generous fairways, no bad rough to worry about, hazards like lakes and bunkers not hard to avoid etc. A 4-5 handicap player will give serious thought to coming in under par here, even off the white tees. For anyone 15 handicap or under, Santa Clara is absolutely not a tough course. But then you simply have to lower your expected score to adjust. There are only a few negatives for this club/course as a whole. Firstly, the cost is not unreasonable but fairly high compared to other mid-ranking courses close by. To me about €10-€15 overpriced on average. Secondly, holes 1/9/10/18 all run in parallel and close by each other just to the right of the clubhouse. So you might wait on a tee box for other people on a nearby fairway to play up. The starter sorts this all out, but it can still mean some delay. Thirdly, the food and drink is fully-priced. By that I mean not expensive, but still not any kind of bargain. I reckon prices set by someone who charges what he/she thinks customers will tolerate, rather than pricing that people tell their friends is really good value. 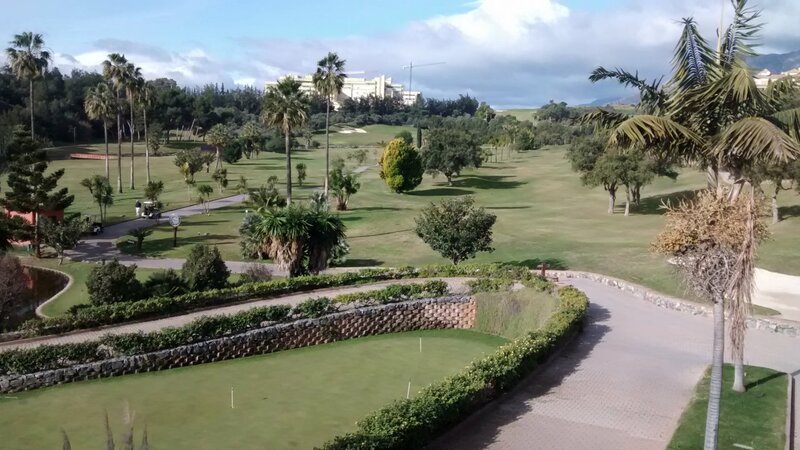 So to summarise: Santa Clara is a medium-quality golf course, very well-maintained, designed to be forgiving and attract a wide range of golfers. A good course for a bunch of touring golf buddies having a relaxed but not too challenging day out. Perhaps a bit on the expensive side, but in my opinion worth it. For better and/or more regular golfers, still a course in good condition – although there are more subtle courses around at similar price. Review last updated: December 2014. Number of times played: 5. Santa Clara is represented by the yellow dot. This shows the course is just under average on both length and difficulty compared to all other courses on the Costa del Sol. An 18-handicap player can expect to go around this course in 19 over par.